The TFM group currently has over 20 qualified technicians and 10 apprentices. All TFM technicians receive extensive, on going service and technical training, ensuring that every technician has the highest level of product knowledge and expertise. And that’s something you’ll appreciate, whether your machine needs a thorough overhaul or you could use some quick advice on an error code. All our qualified technicians are accredited to LTA3 standard. The LTA scheme is to provide a nationwide means of benchmarking, monitoring and assessing the competence of technicians employed within the sector. Each LTA 3 technician is a skilled & experienced technician who has successfully attended a series of assessed course programmes. All our LTA3 technicians are also specialists on a specific product. 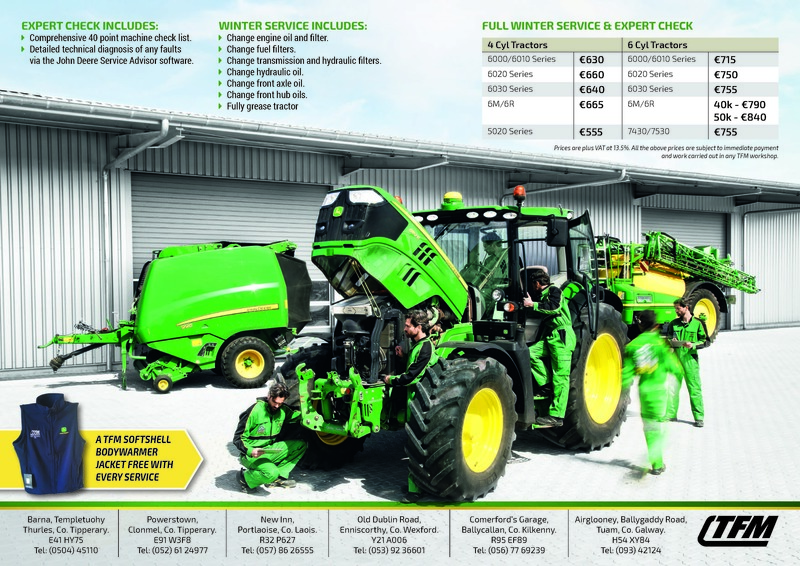 Collectively our workshops can facilitate 27 tractors and 7 harvesters at any one time and with a fleet of 20 fully equipped service vans available 24/7 we have the capabilities to get your machine back up and working as quickly and efficiently as possible. 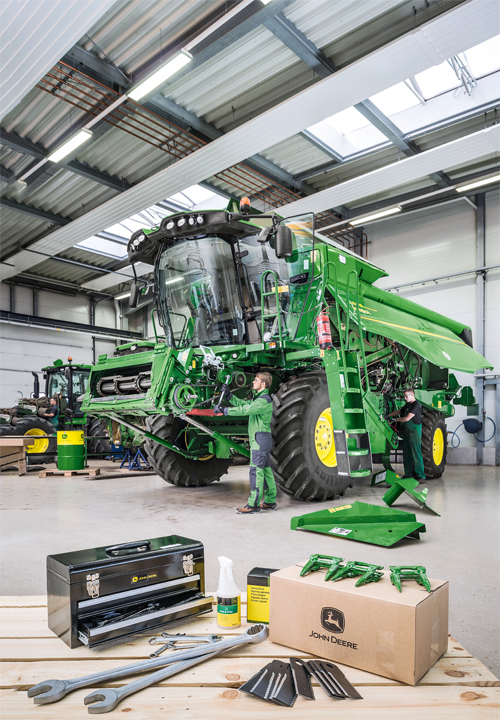 Due to the continuing changing product lines TFM invests in excess of €8,000 annually on John Deere specific special service tools. TFM has a total of 15 service advisor diagnostic units. 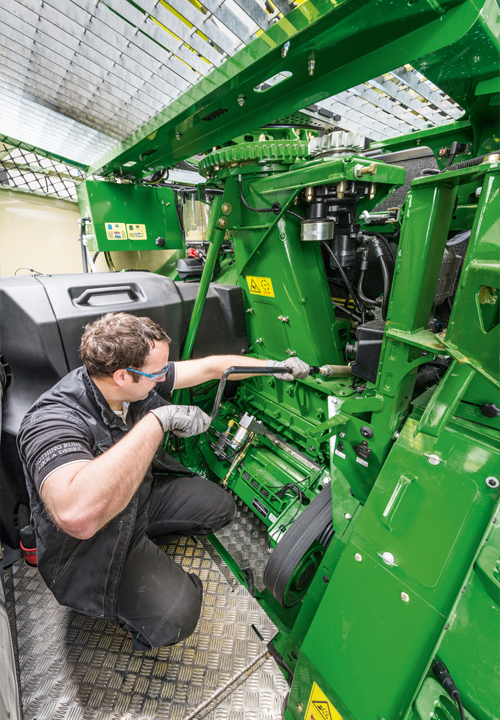 Service Advisor is John Deere’s exclusive machine diagnostic system provides our technicians with immediate and accurate diagnostic information to help speed up repairs and reduce machine downtime. Service Advisor Remote is an additional feature of service advisor, our well established service tool used by our T.F.M technicians to perform diagnostics and install updates to machine settings and software. Now the technicians can remotely access your machine’s diagnostic system via the JDLINK infrastructure and inform you of any updates available that will keep your machine running at peak performance. It’s like having your own personal infield technician who travels with your tractor everywhere it goes. It can save you time and money on repairs, as your technician doesn’t have to make a visit to diagnose the machine’s problem and then arrange a follow up visit to carry out the repairs. Instead they can remotely identify issues, diagnose the cause of problems and bring out the parts all in one visit, ensuring your operation is as efficient and cost effective as possible. 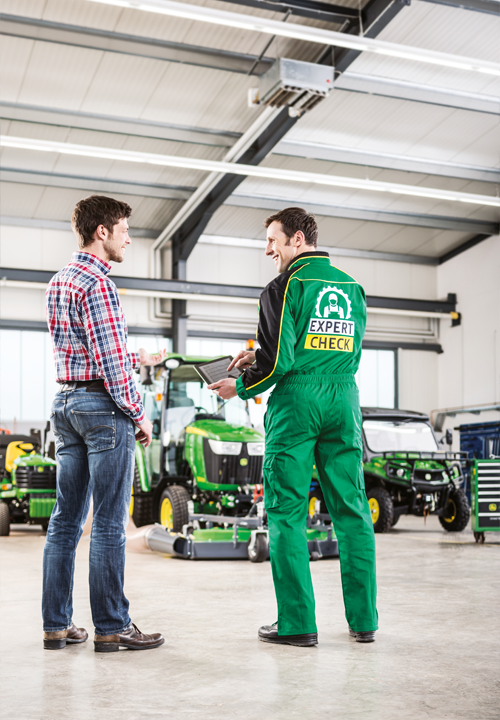 All technicians have access to DTAC John Deere’s Dealer Technical Assistance Centre. 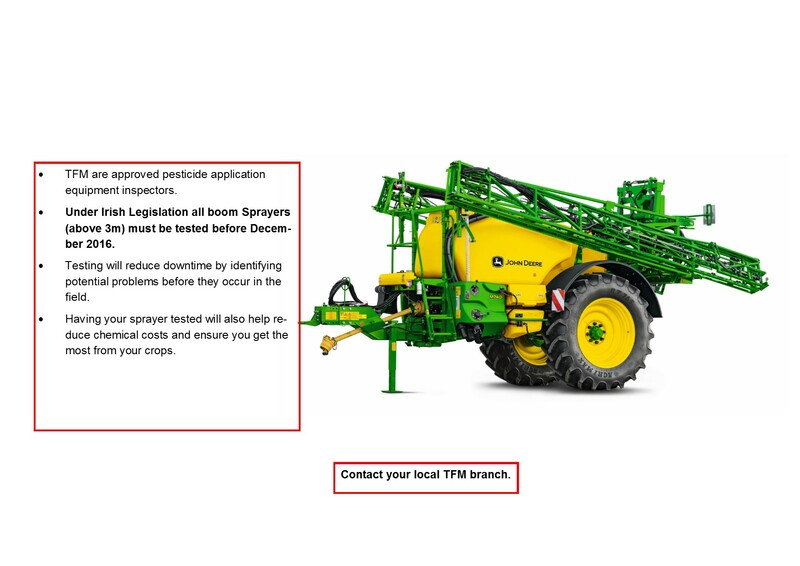 This is an online database of technical information updated by John Deere’s factory and product support specialists from around the globe. The DTAC system also allows the technician to create problem cases online. These cases are then worked on immediately by the relevant John Deere support and relevant personnel. Machine handover and operator training is an increasingly important role for our service dept. Technicians are on hand to instruct owners and operators on how to get the best from their machine from in cab controls right through to maintenance. Technicians can also assist operators with in field set up of new machines to ensure every machine is working to its optimum level.